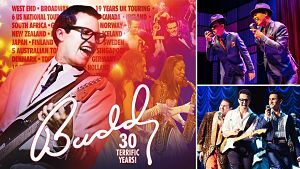 Having just completed a successful six month tour of the US & Canada, the rock & roll musical Buddy - The Buddy Holly Story is set to celebrate its 30th anniversary next year by returning to the Theatre Royal Plymouth which was where it first opened in 1989 before transferring to the West End, where it ran for over 14 years (at the Victoria Palace, Strand and Duchess Theatres). Buddy tells the tale of his meteoric rise to fame and his final performance at the Surf Ballroom in Clear Lake, Iowa, before his tragic and untimely death on 3rd February 1959 when he was tragically killed at the age of 22, leaving behind a legacy of over 30 timeless hits. Buddy tells his story with two hours of his greatest hits including That'll Be The Day, Peggy Sue, Rave On, Oh Boy, Chantilly Lace, La Bamba and many more. You can also hear the Crickets, the Big Bopper's Chantilly Lace and Ritchie Valens' La Bamba during this live music extravaganza which has the audience rocking and bopping in the aisles. To celebrate this landmark anniversary, there will be a special gala performance on Monday 2nd September, with a limited number of tickets being offered at the original 1989 prices (from £7 - £10.50). Further details of this exclusive event will be released in due course.